Recently, violations of international law have escalated in the Occupied Palestinian Territory (oPt), particularly after several political developments that have threatened of ending Palestinians’ right to self-determination and return along with tightening the closure on the Gaza Strip which is on the blink to collapse. These developments led to a popular march started on 30 March 2018 in the Gaza Strip, demanding the right to return and end of the closure imposed on the Gaza Strip. Since that day, demonstrations took place on a daily basis in five areas adjacent to the armistice line in the Gaza Strip. These areas are classified as Access Restricted Areas (ARA), which the Israeli forces deny access to. The demonstrations have been seen as part of the peaceful popular resistance aiming at convoying messages to the world; most notably the demand for the return of all those who were displaced from their cities and villages by the Zionist gangs in 1948, as stipulated by the United Nations General Assembly in its resolution 194. These demonstrations reach a peak on Fridays, with the participation of different groups of society of different ages and affiliations. The demonstrations include cultural and folkloric activities and sometimes burning tires and young men throwing stones, which can not reach the places where the Israeli soldiers are stationed and so the life of the later are not posed to danger by any means. Since the beginning of the demonstrations, the Israeli forces used excessive force to confront these demonstrations. They killed 13 civilians on its first day and wounded 1031 others, including 218 children and 34 women, who posed no threat to Israeli soldiers in a crime that shocked the human conscience and was condemned by most of the world countries. At that time, the United States vetoed and so obstructed issuance of a Security Council resolution to form a commission of inquiry into the events. In the aftermath, the violations continued on their pace against the Return March demonstrations. In fact, the Israeli forces, in more than one statement by their leaders, insisted on continuing to deal with the Palestinian peaceful demonstrations with the same shooting instructions, which consider merely approaching the border fence is a sufficient reason to kill. Moreover, the leaders of the Israeli forces on social media tweeted that they would target any provocative in the demonstrations. The violations reached the peak on 14 May 2018, where the US Embassy inauguration was held in occupied Jerusalem. As a result of the implementation the illegal decision of the US to relocate its embassy in Israel to Jerusalem occupied since 1967, the demonstrations intensified, coinciding also the Palestinian Nakba day when Palestinians were displaced from their lands and the State of Israel was established. The use of live fire, artillery shells and teargas against the peaceful demonstrators resulted in the killing of 42 Palestinian civilians, including 5 children, and wounded more than 1,500 civilians in the Gaza Strip within one day. As a result, the death toll since the beginning of the Return March demonstrations has risen to 86, including 12 children, 2 journalists and 3 persons with disabilities. In addition, the number of those wounded has risen to 5106, including 860 children, 158 women and 29 paramedics. The Palestinian Center for Human Rights (PCHR) is concerned over the events in the occupied territory. 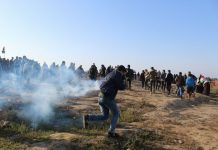 PCHR confirms via its close follow-up of the events in the field that the demonstrations in the five locations (where the symbolic Return tents were pitched) were attended by civilians and there were no armed persons witnessed among the demonstrators who posed no danger to the Israeli soldiers. PCHR also confirms that the Israeli soldiers deliberately targeted the demonstrators in cold blood and deliberately inflected casualties, apparently to prevent and suppress the demonstrations. The United Nations Security Council, in an emergency meeting on Tuesday, 17 May 2018, addressed the blatant violations and killings in cold blood committed by the Israeli forces against the demonstrators in the Gaza Strip protesting against the relocation of the U.S. Embassy and calling for their right to return to their cities from which their ancestors were expelled in 1948. The UN Security Council is expected to vote in the coming days on a draft resolution to provide an international protection for the Palestinian people from the Israeli Suppression. On a different note, PCHR emphasizes that Intentional Criminal Court (ICC’s) move towards opening an investigation into the crimes committed in the occupied territory has become an absolute necessity at this time to confront the culture of impunity which has encouraged the Israeli authorities to continuously commit crimes against the Palestinian people. During its absolute support for Israel, the U. S. Administration is directly involved in these crimes as it has attempted to fail issuing any resolution against the Israeli crimes. It should be noted that the Palestinian President signed a decision to refer the Israeli violations and crimes since 2014 to the ICC. This decision is an official request from the ICC Prosecutor to open an investigation into these crimes. Even though this referral is non-binding to the ICC to open an investigation, the refusal in thise case shall be causative and in all cases can be challenged before the Pre-Trial Chamber of the ICC according to Article 53 paragraph 3. PCHR supports all steps aiming at pushing the Human Rights Council which will convene tomorrow to form an international commission of inquiry in the Israeli crimes against the demonstrators in the Return March. This would be a right step that would help to reinforce the efforts to prosecute the Israeli war criminals through the ICC, particularly that the ICC has opened a preliminary examination of the current events in the Gaza Strip since 08 April 2018. PCHR also supports the Palestinian leadership’s decision to pushing ahead with resorting to the ICC to ask for an advisory opinion relevant to the lawfulness of the relocation of the US Embassy to the oPt in violation of many international resolutions and a previous advisory opinion by the ICC in 2004, which have all confirmed the legal classification of the territory seized by the Israeli authorities in 1967 as an occupied territory. PCHR reiterates its condemnation of relocating the US Embassy to occupied Jerusalem. PCHR also condemns the Israeli forces’ crimes of killing and wounding in cold blood the civilian demonstrators who demand the right to return and protest relocation of the U.S. Embassy. 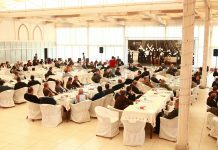 PCHR appreciates and supports the Palestinian official steps and calls upon the international community to uphold them. PCHR emphasizes that the action of the current American Administration and Israeli authorities not only undermines the international human rights system, but the whole international law, resulting serious precedents at the international level that encourage the defiance of the international law provisions and warns of dangerous chaos. Therefore, PCHR calls upon the European Union to take firm positions to convict breaking the international law and take clear steps to stop it. PCHR stresses that the International Criminal Court (ICC) opening an investigation in the Israeli crimes would directly help in putting an end to the violations of the international law in the occupied territory, including the killing crimes in cold blood and the settlement crime. Thus, PCHR calls upon the ICC Prosecutor to initiate an immediate investigation. PCHR stresses on considering the Presence of the U.S. embassy in the occupied territory as a new settlement outpost in occupied Jerusalem and should be treated by the world according to this logic. According to Security Council Resolution 2334, which condemns settlement and stresses on obliging the states to distinct in treating between the Israeli presence in the occupied territory and in the other territories. Therefore, PCHR calls upon the international community to take clear position from the U.S establishment of a settlement outpost in occupied Jerusalem. 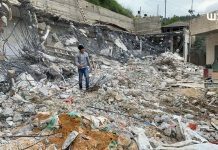 PCHR confirms that the international protection is a right to the Palestinian people in light of the Israeli unrestrained crimes committed in the occupied territory. PCHR also calls upon the world, particularly the European Union, to practice pressure in order to urgently provide this protection to stop the Palestinian shedding blood.